The Bermuda Underwater Exploration Institute [BUEI] and the ADARA group will host “Climbing For Kids” on Thursday, November 30th at 7:30pm. The event poster says, “Join us for a special evening of stunning imagery, laughter and storytelling at the Bermuda Underwater Exploration Institute. 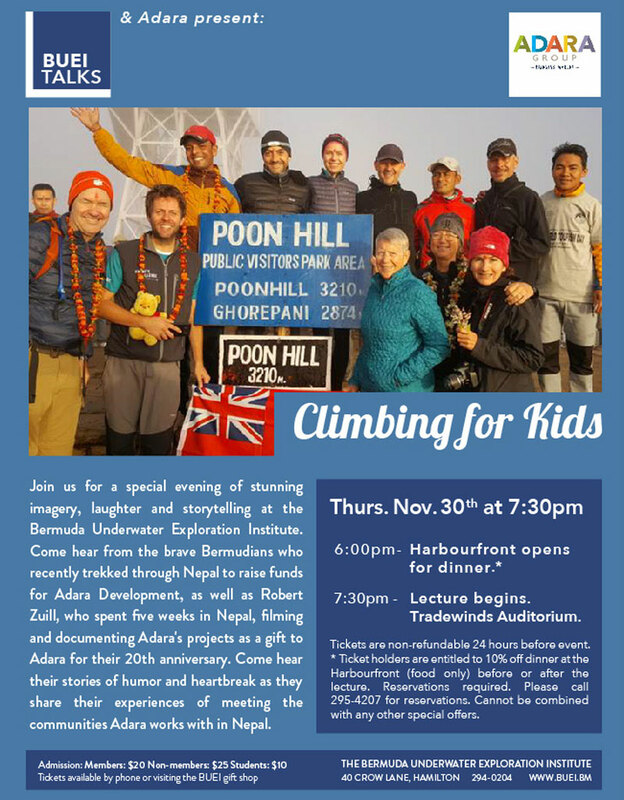 “Come hear from the brave Bermudians who recently trekked through Nepal to raise funds for Adara Development, as well as Robert Zuill, who spent five weeks in Nepal, filming and documenting Adara’s projects as a gift to Adara for their 20th anniversary. Come hear their stories of humor and heartbreak as they share their experiences of meeting the communities Adara works with in Nepal.